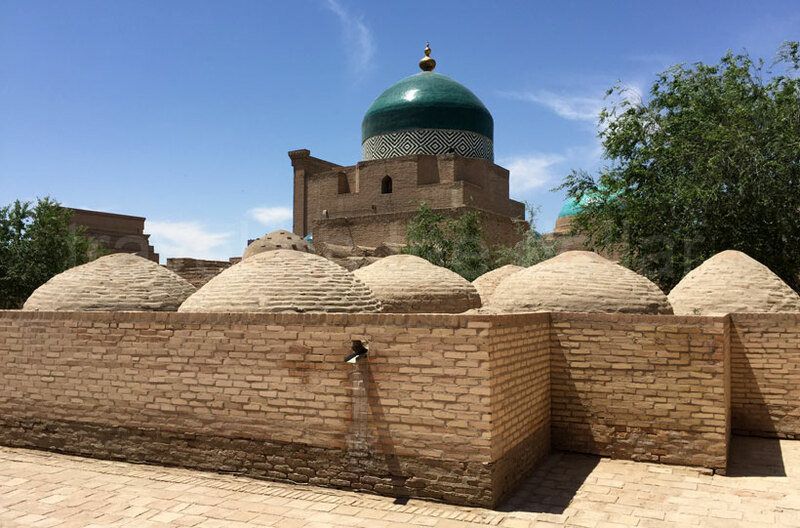 Most travelers visiting Uzbekistan stick to the three big cities of Tashkent, Samarkand and Bukhara that offer innumerable sights of the splendid mosques, madrasas and minarets. 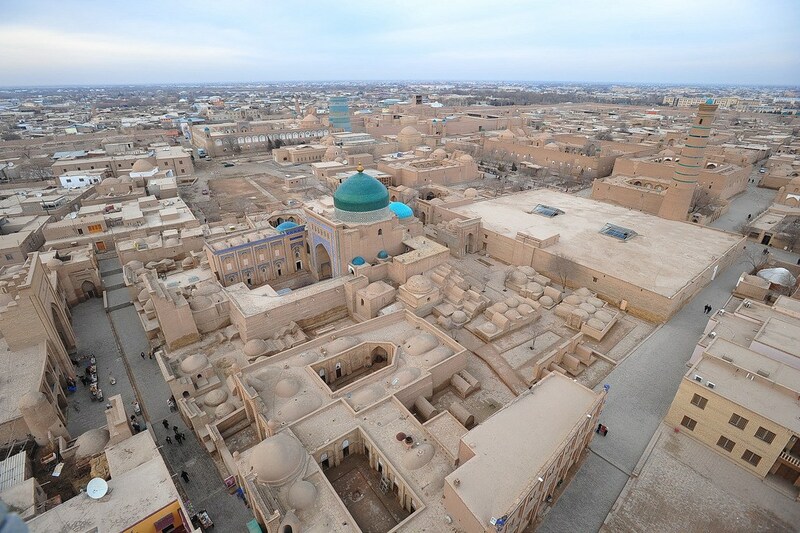 But visiting Khiva is a must for any traveler for its incredible old town. 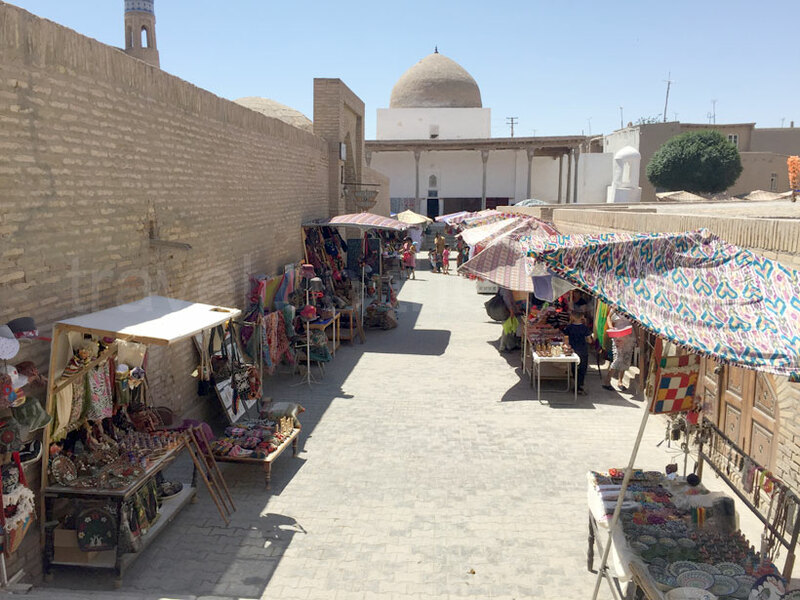 Known as Ichon Qala (or Old City Fortress), the old town is walkable and can be easily visited in one day. 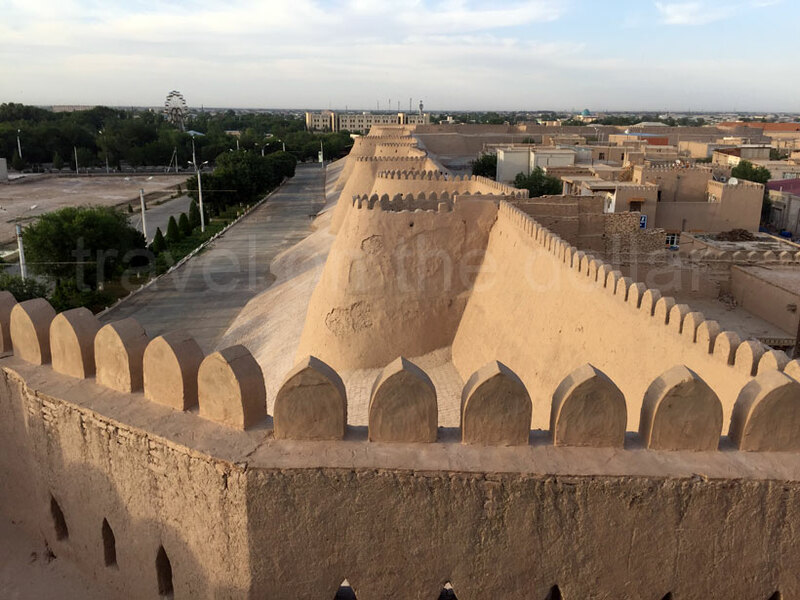 With its incredibly preserved Persian-built fortress walls, Khiva’s name had been synonymous with the caravans of a brutal, systematic slave trade that kept the city profitable during the Silk Road days. The constant threat of marauding raiders of the desert mad this city a destination only for the most determined, ruthless traders. 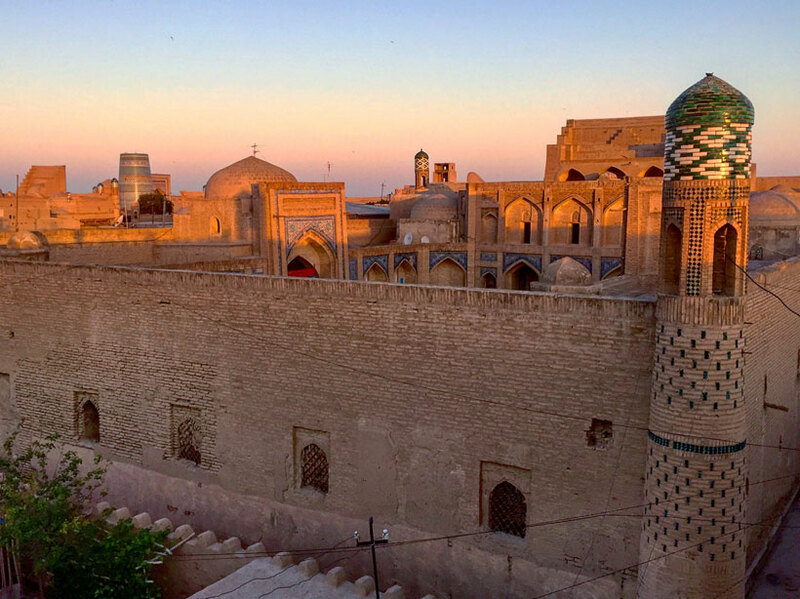 Hundreds of years later, after the rise of fall of many kingdoms, empires, and regimes that remarkably spared this city, it has become the most well-preserved medieval city of the Islamic world. 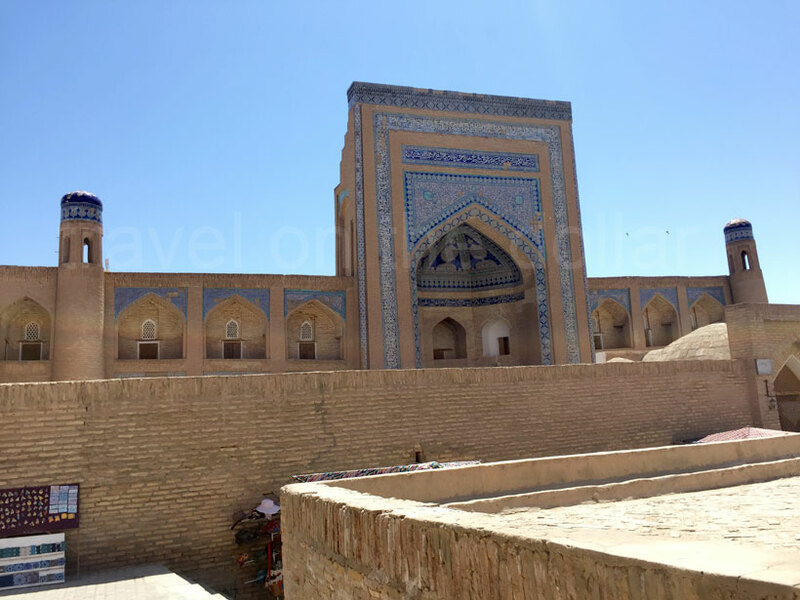 The best way to visit Khiva, located in western Uzbekistan, is to fly in to Urgench airport where Uzbekistan airlines flies daily, non-stop, between Urgench and Tashkent taking an hour and forty minutes. 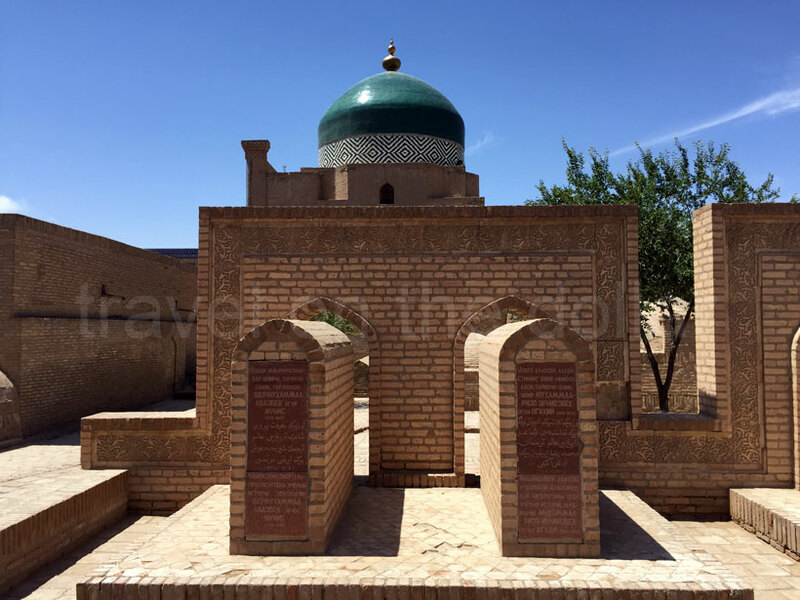 Urgench is the capital of the Khorazem region and has always been regarded as a missable stopover city; a short distance from Khiva, one of the three great epicenters of the Silk Road (Samarkand and Bukhara among the other two). 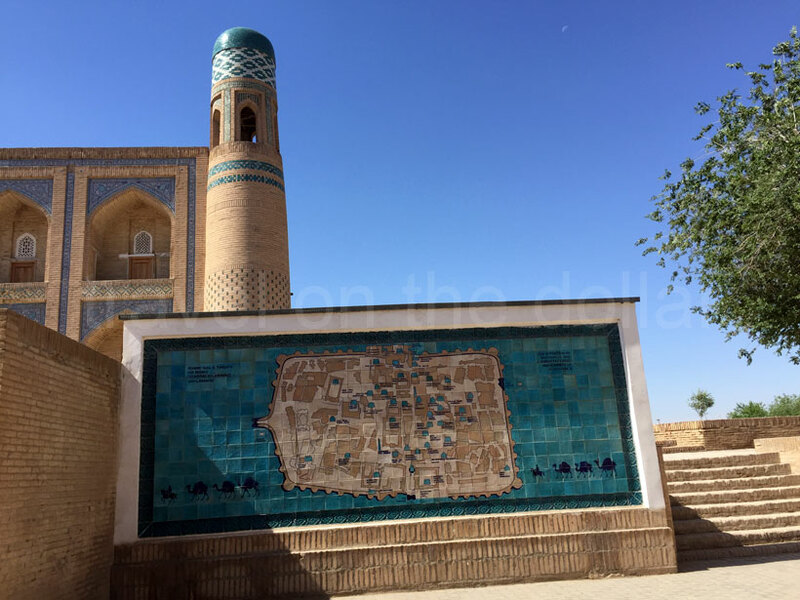 A taxi drive of about 30 minutes from Urgench airport brings you to this city, just across the border from Turkmenistan. 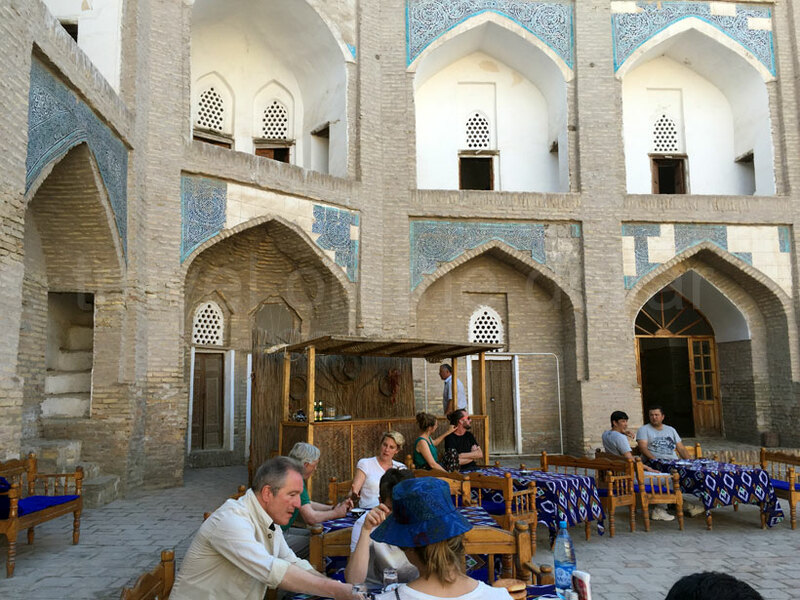 If you arrive the night before then we recommend staying at Mirza Boshi hotel, that is located in the heart old city. 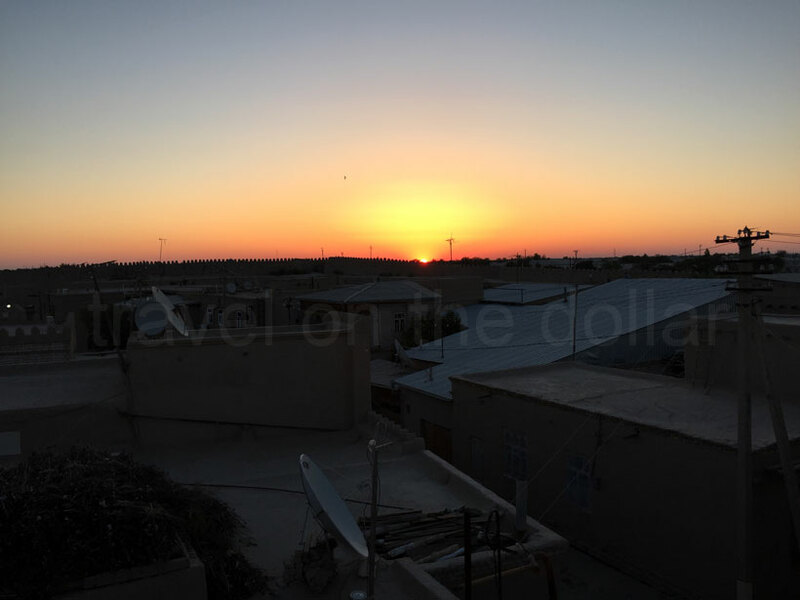 Begin your day by waking up before sunrise and head over to the rooftop of the hotel for a perfect location to see the minarets glistening in the morning sun, and mullahs (priests) walking along the mud streets to call for morning prayer. 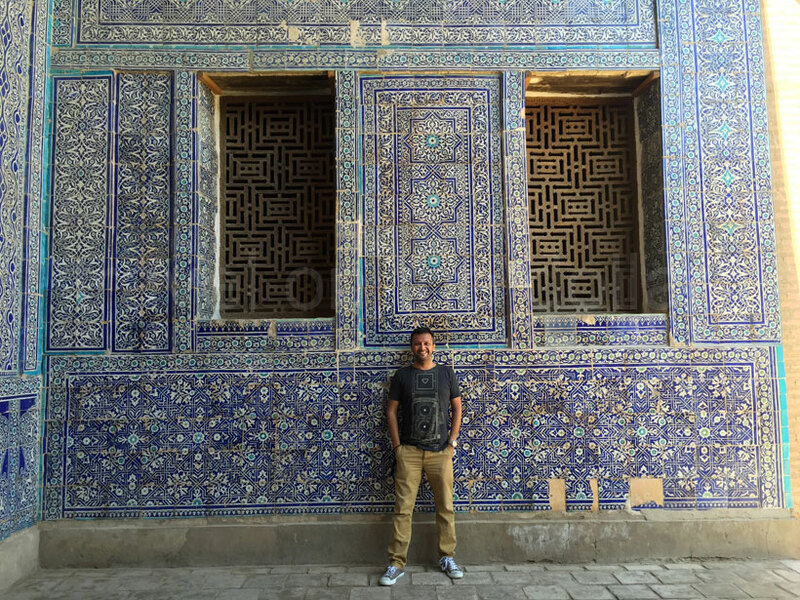 Getting a tour guide definitely helps understand the history of the city, but you can do all the sights on your own. 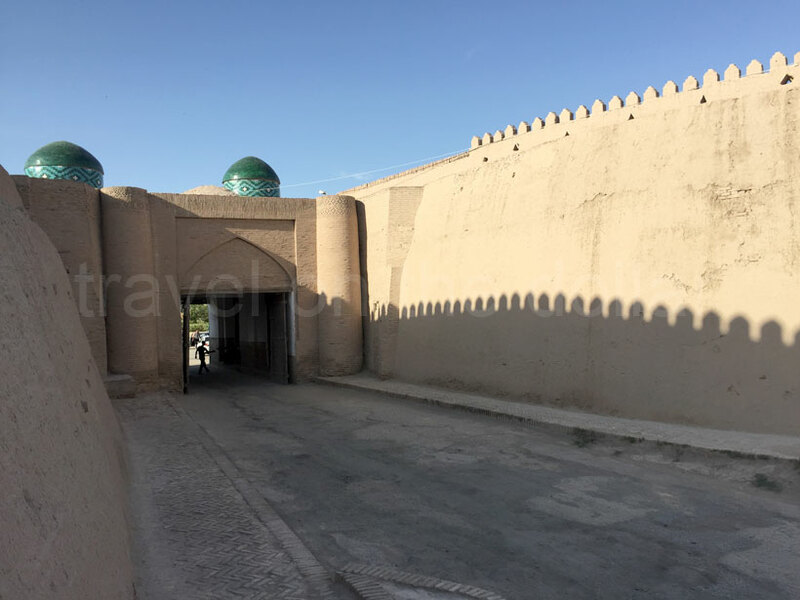 Walk to the West Gate (Ata Darwase), which is the main exit and entry point for almost all of the visitors. 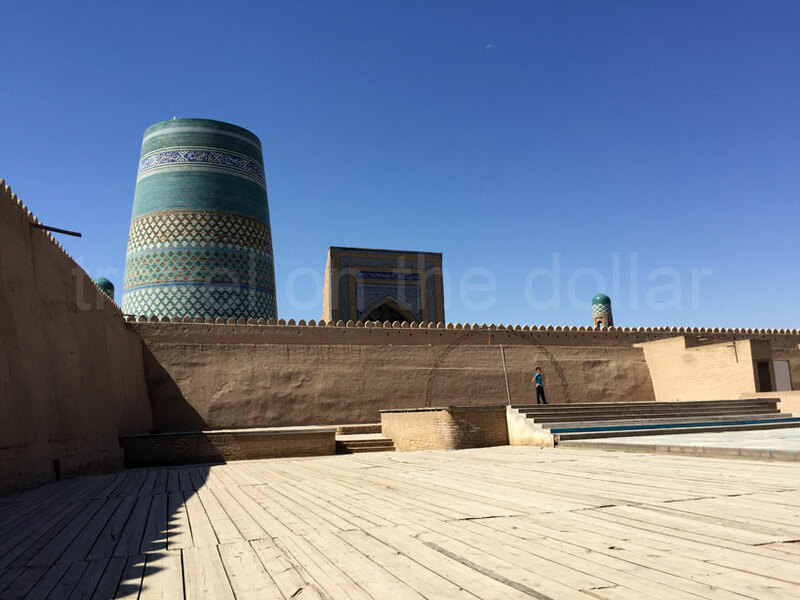 First off is a short history of Silk Road and how all the places around Uzbekistan came around to be the trading spots for various kingdoms, empires and what it was today. 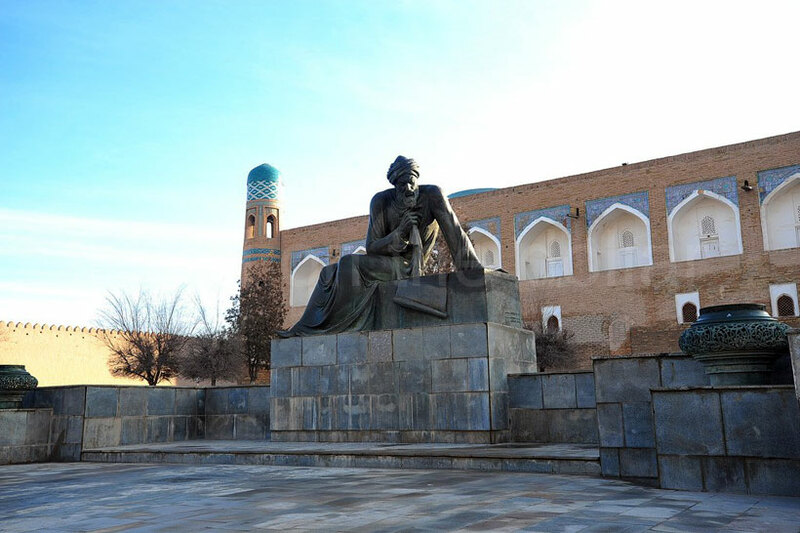 There’s a huge statue of Muḥammad ibn Mūsā al-Khwārizmī (Latin: Algoritmi), who was a prominent mathematician and the father of modern algebra and the concept of algorithms. 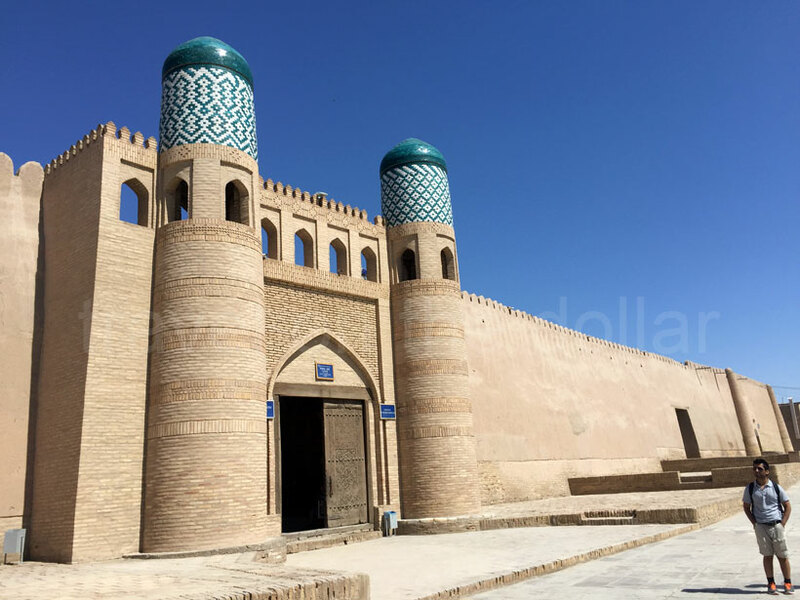 Although you were already inside the walled city before re-entering, that allows you to take all the pictures for free, you will have to pay UZS 5,000 (~ USD 0.90) as photographer’s fee, which also serves as an admission ticket good for two days. 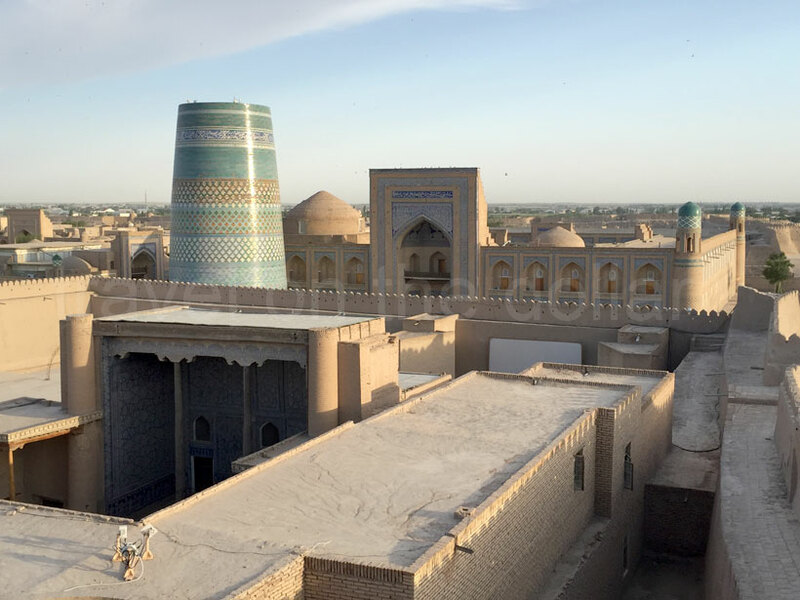 The first monument on the right is the 19th century Mohammed Amin Khan Madrasa, now converted into Hotel Orient Star, open from March to November. 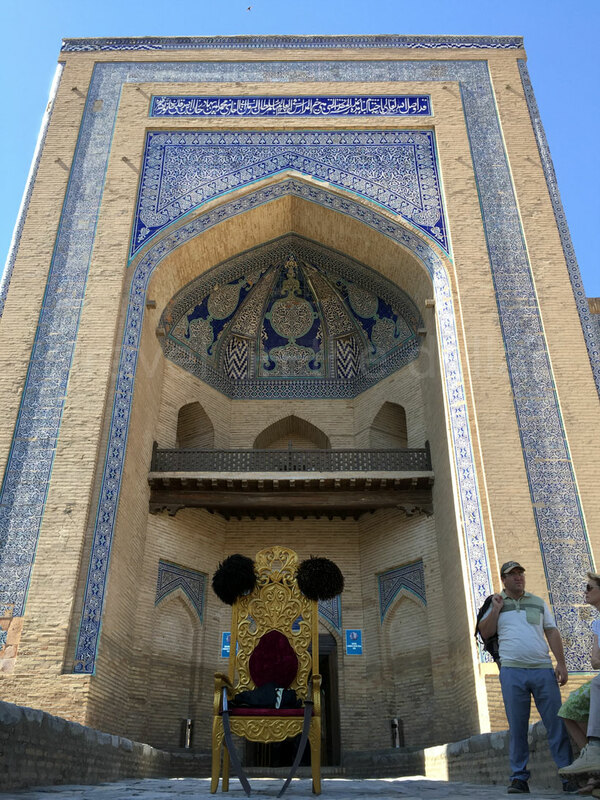 There’s a sultan’s chair in front of the entrance where tourists can dress up at the Sultan and take a picture for UZS 10,000. 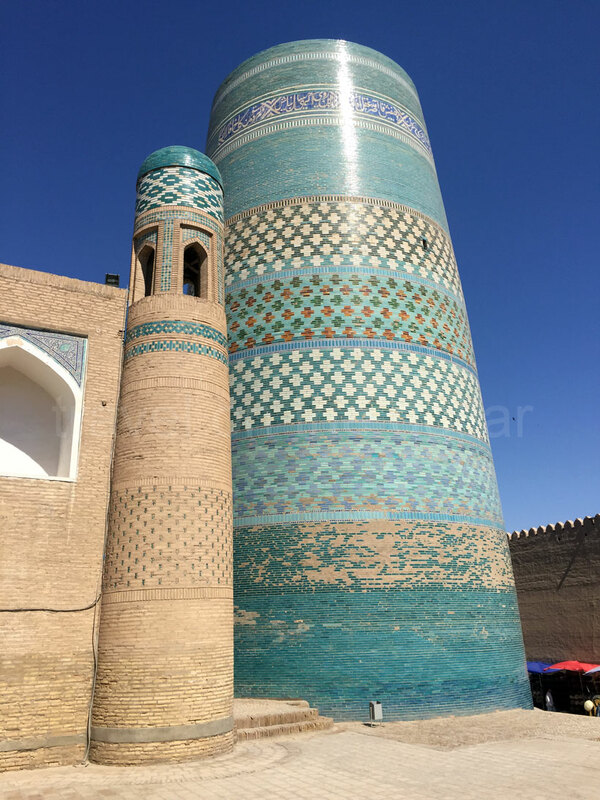 The stunningly beautiful turquoise structure beside the Madrasa is Kalta Minor Minaret, which was only half-finished (and destined to forever be so) after the ruler at the time, Mohammed Amin Khan, died suddenly. 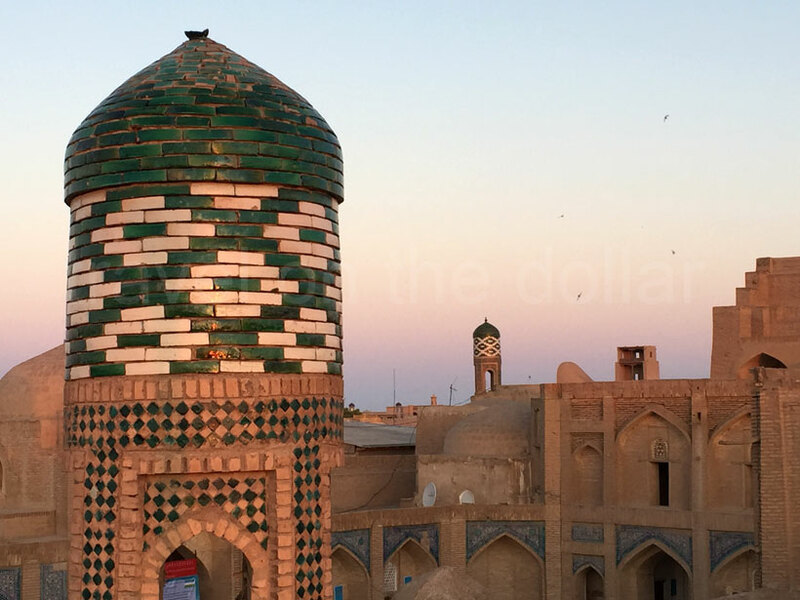 This iconic beauty can be seen from almost anywhere in Khiva. 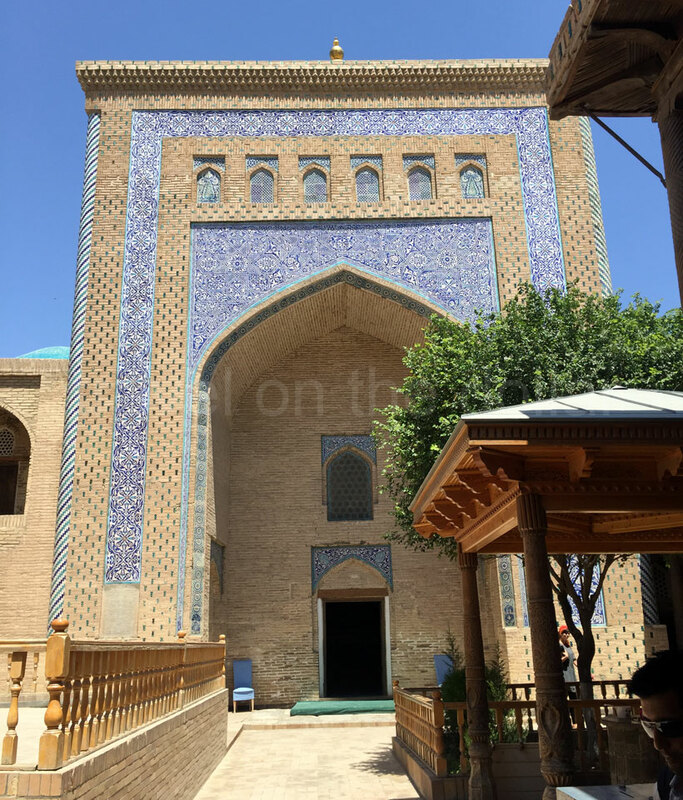 Turned left, walking east past the Kaltor Minor Minaret and on the left is an entrance way to a courtyard where you can see the Mohammed Rakhim Khan Madrassa to the east and Kunya Ark to the west. There’s a great description and history in this article. 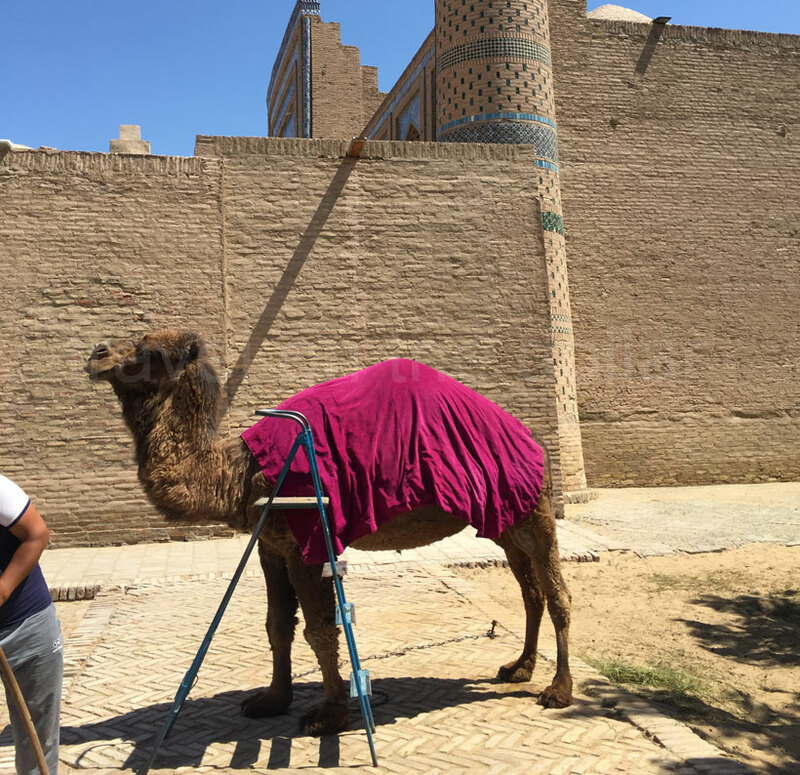 Hanging out on the south wall of Mohammed Rakhim Khan’s Madrasa is Khiva’s mascot camel, Katya. You can take photos with Katya, or ride her on her back for a few thousand UZS! 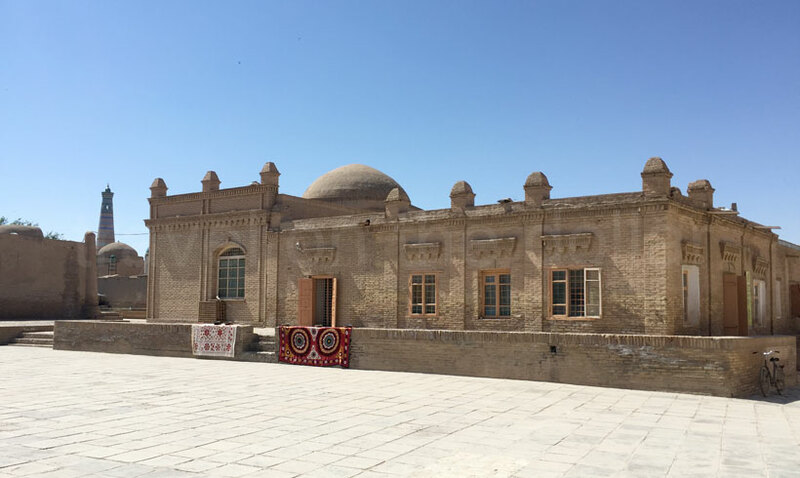 Next up is Djuma (Friday) Mosque in the center of Ichon Qala. 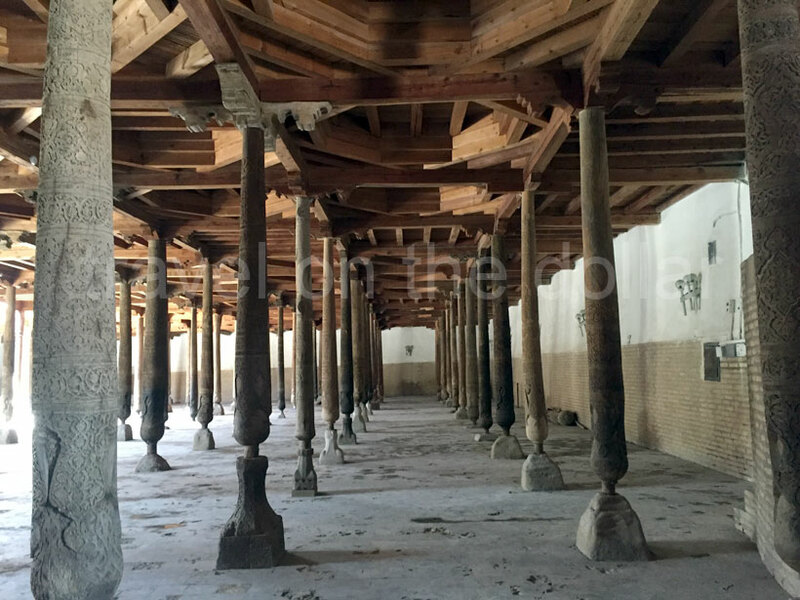 This is built in 18th century to resemble the Arabian mosques of ancient times with its 215 wooden pillars supporting its flat ceiling. 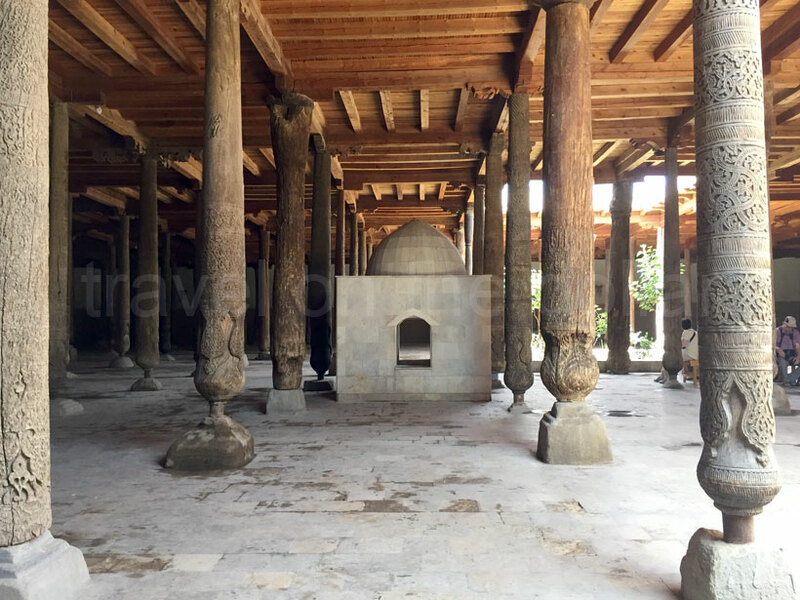 About 6 or 7 of these columns date as far back as the 10th century and can be told apart by their relatively wider and larger size. 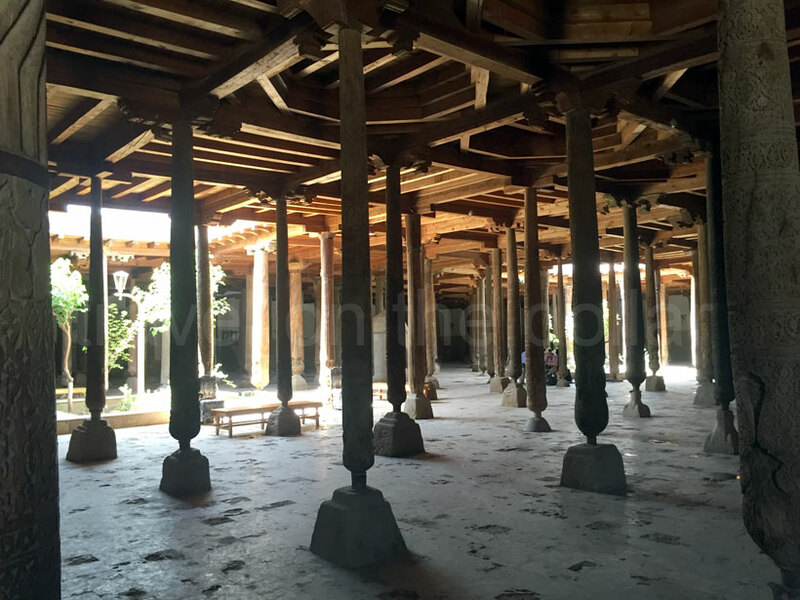 The forest of pillars standing in the semi-darkness of the hall, adorned with the best patterns of Khorezm carving is expressive of the inimitable art of the local masters. 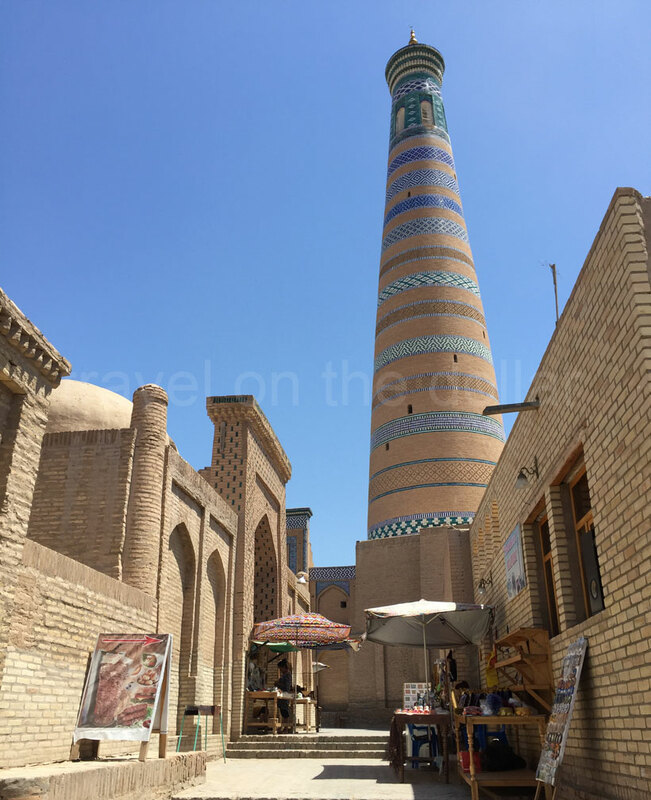 Wander around the streets of Khiva, along the tiny alleyways and narrow muddy streets, through small madrasas and souvenir shops, and stop by one of the roadside shops for souvenirs. 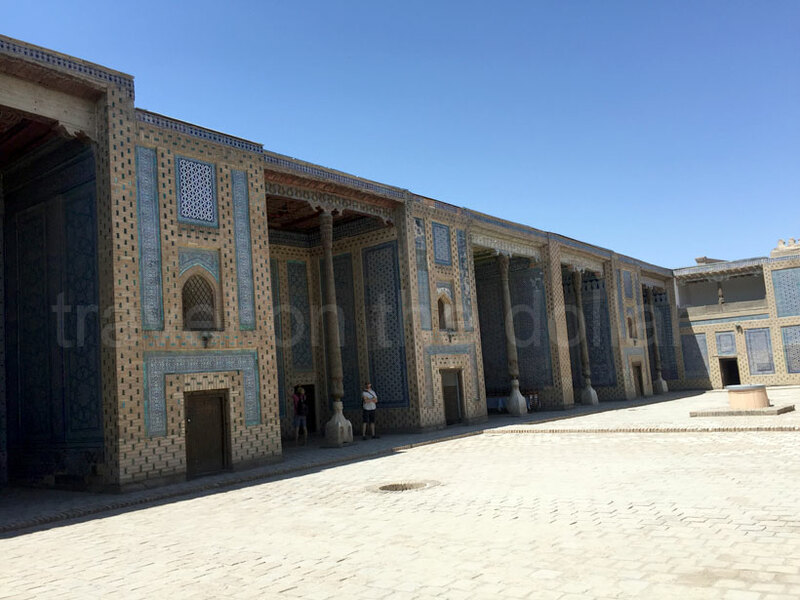 After about 10 minutes of walking, you’ll reach Tash-Khovli Palace, summer residence of Khivan Khans, was built in the eastern part of the inner city. 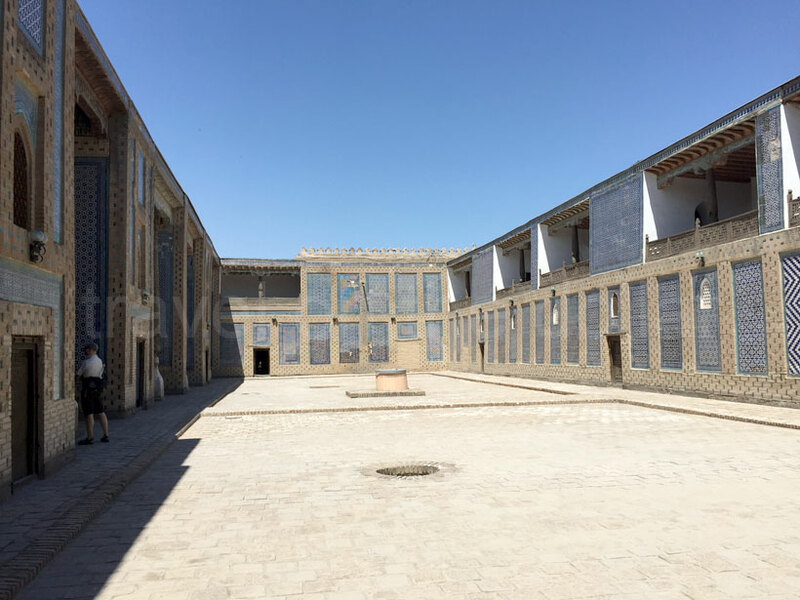 This complex of a building, with three yards, has rectangular plan, in the southern part are the receiving yard, Arz-Khovli, and a yard for entertainment, Ishrat-Khovli. 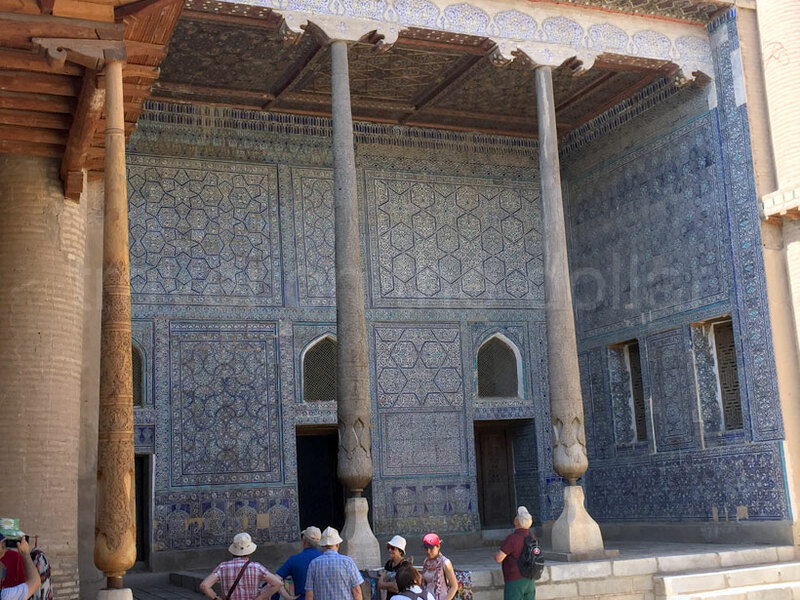 The northern part is occupied by a harem. Labyrinths of corridors join the yards and buildings. 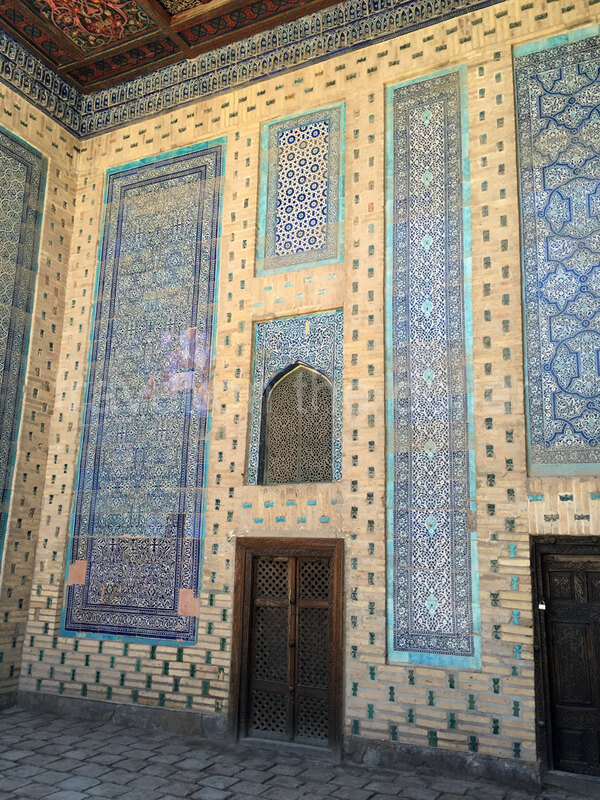 The brothers and relatives of the khan lived in the palace. 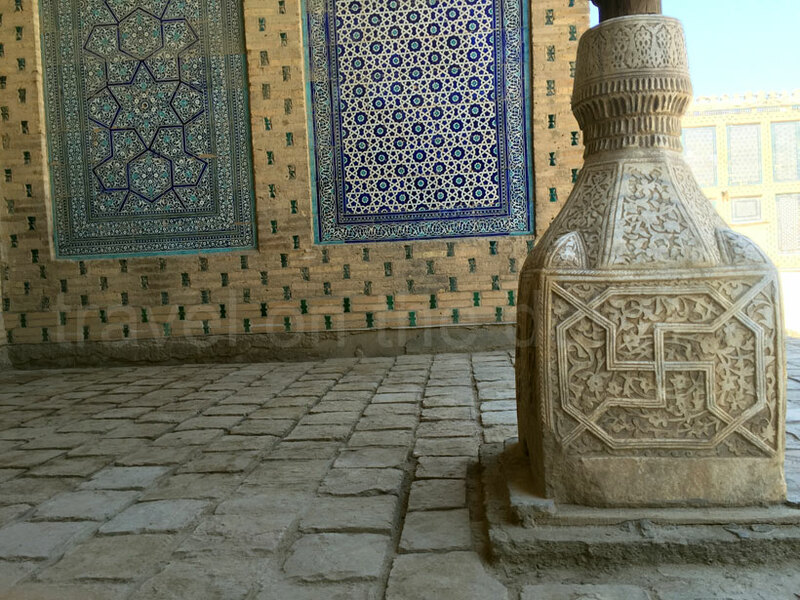 All the constructions were built from the high quality bricks. The fencing walls of the palace end up with figured cogs. From the flatness of the wall, the high well-portioned towers stand out. 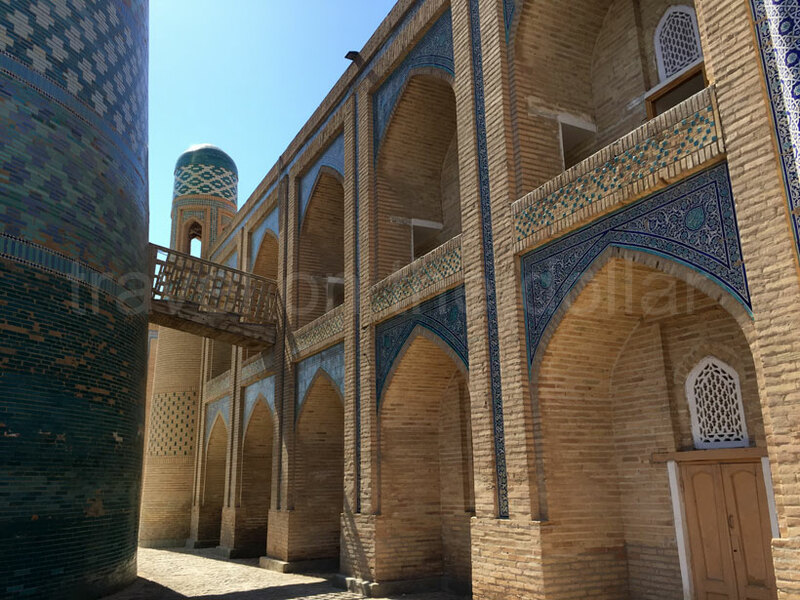 Around the southern part of the square yards, high single-pillar aivans are built with main houses behind them. 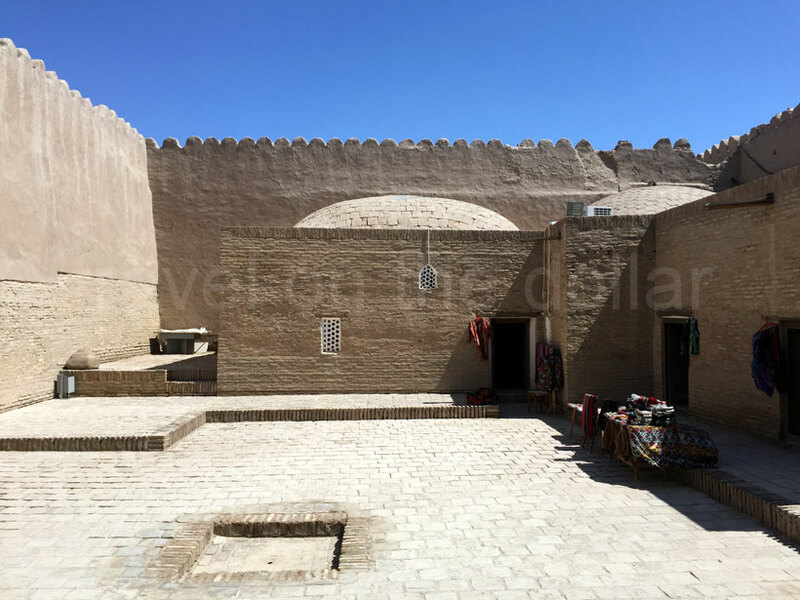 On the other sides are the rooms for guests with small aivans on the second floor. 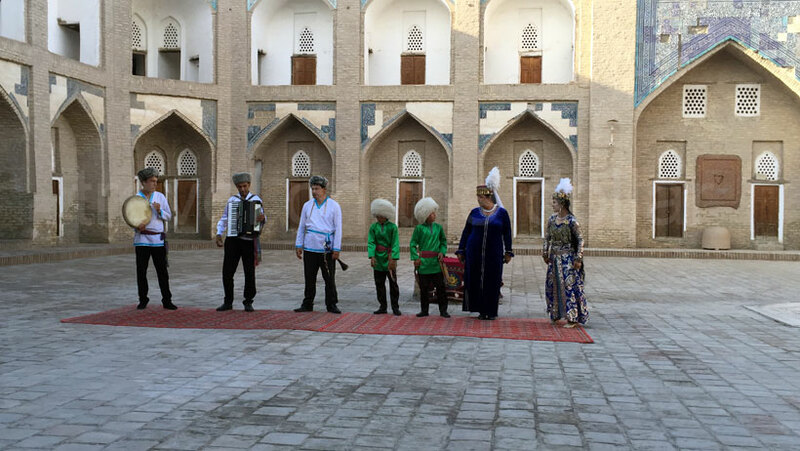 Five excellent aivans come one after another in the harem. 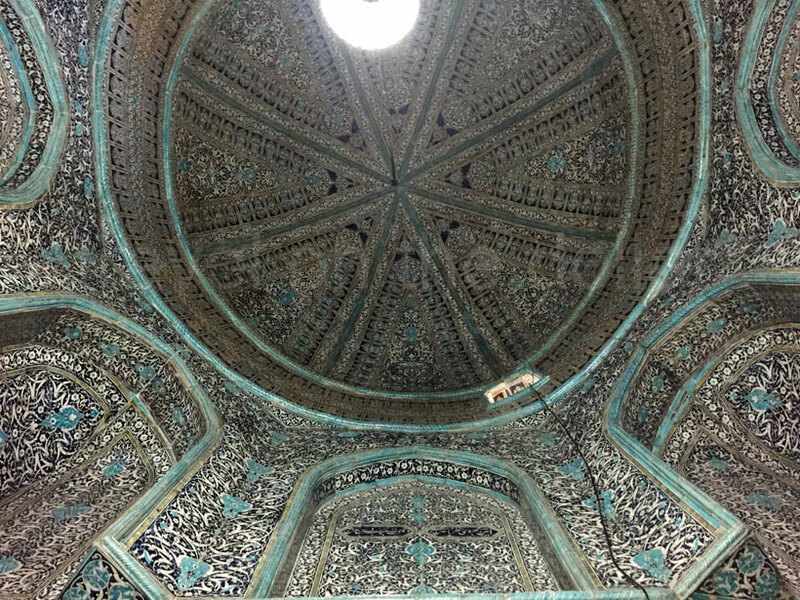 Two rooms were built behind the aivans through a main majolica entrance with a painted ceiling. They are simply decorated dwellings. 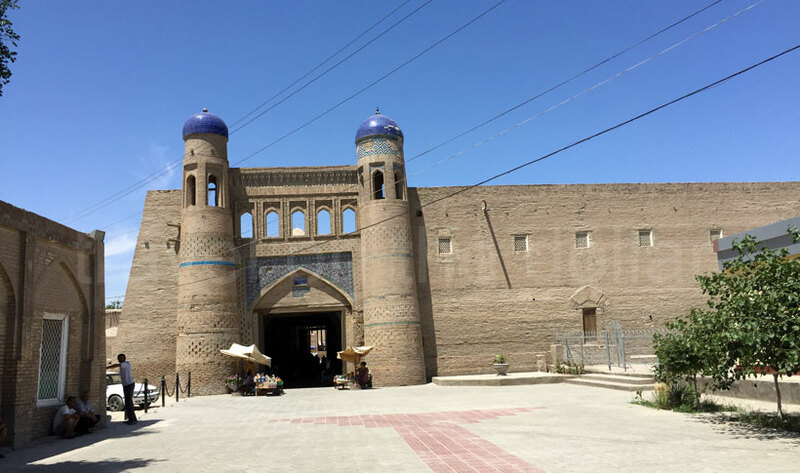 After the palace, find yourself at the East Gate (Palwan Darwase) of the fortress city. 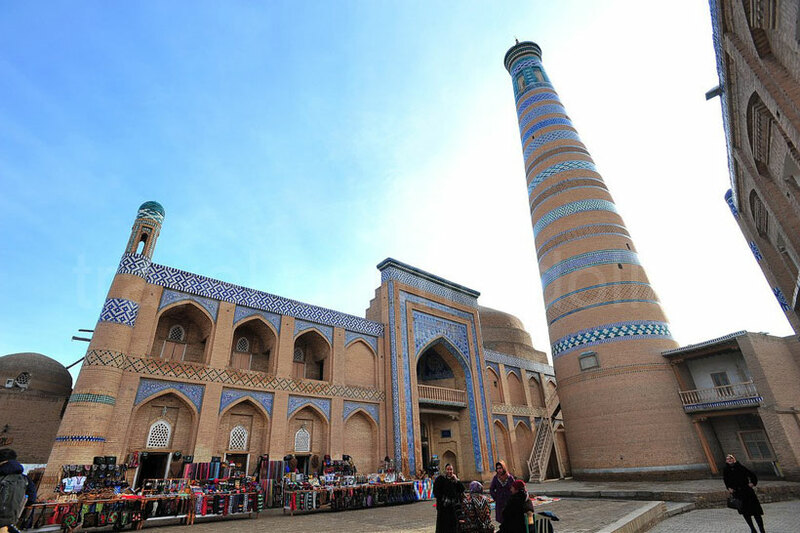 There’s a minaret just outside the east gate, on your right, which tourists can climb to see beautiful sunrise. 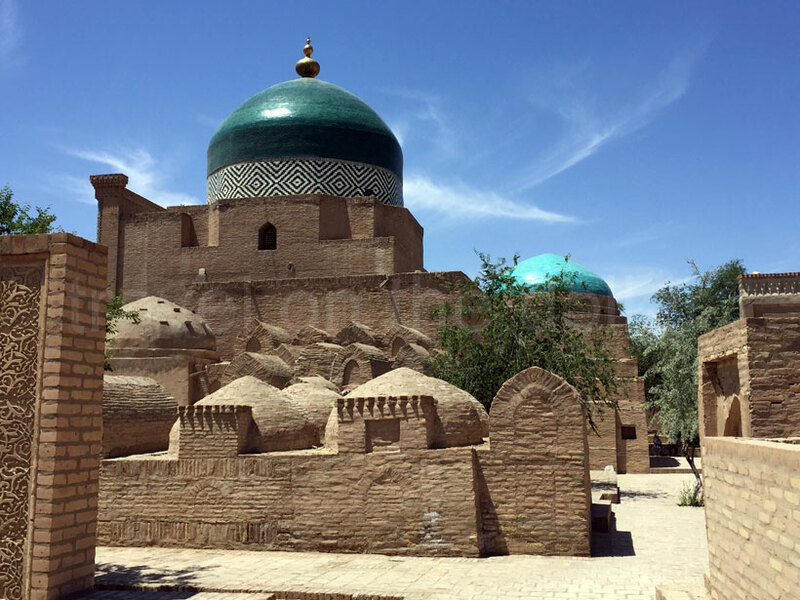 Walk back in the fortress city, and next up is the Mausoleum of Makhmud Pahlavan, a famous poet and warrior of the XIV century. 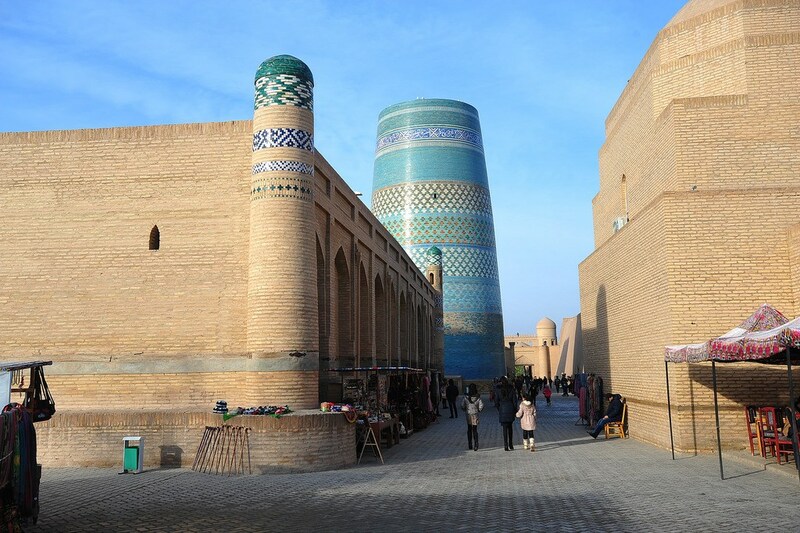 This is the only one blue dome in Khiva. There are a lot of legends about his strength and courage. One of the legends tells that Pahlavan conquered the Indian ruler, and the latter agreed to reward him with whatever the hero would wish. 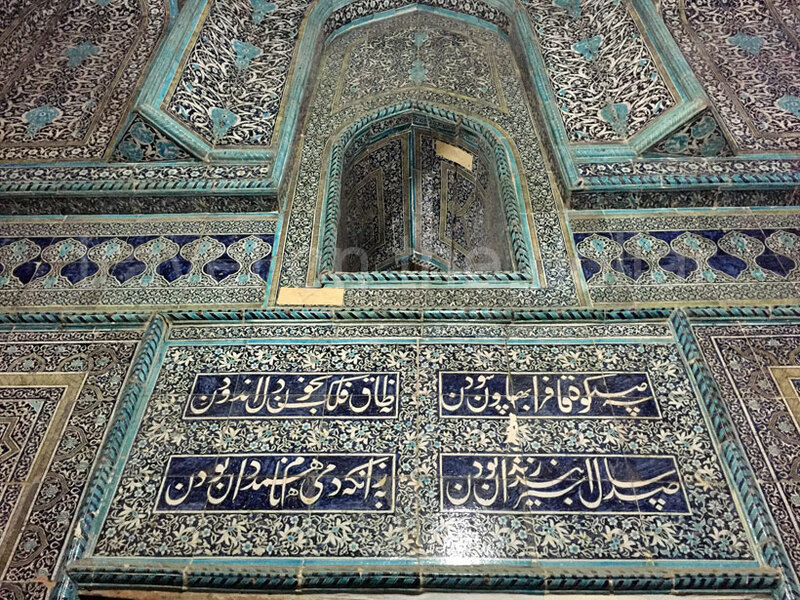 Then Pahlavan Makhmud said: “Release my countrymen from prison.” And when the ruler asked how many people he should release, Pakhlavan told all those who would fit into a cow skin. He cut the skin into thin strips, tied them into one large belt and wrapped all the prisoners with the belt. 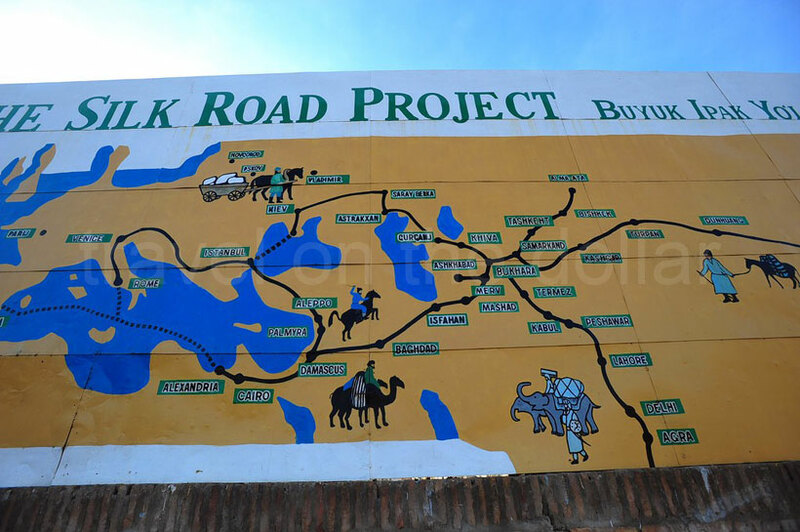 So Makhmud rescued many people from slavery. 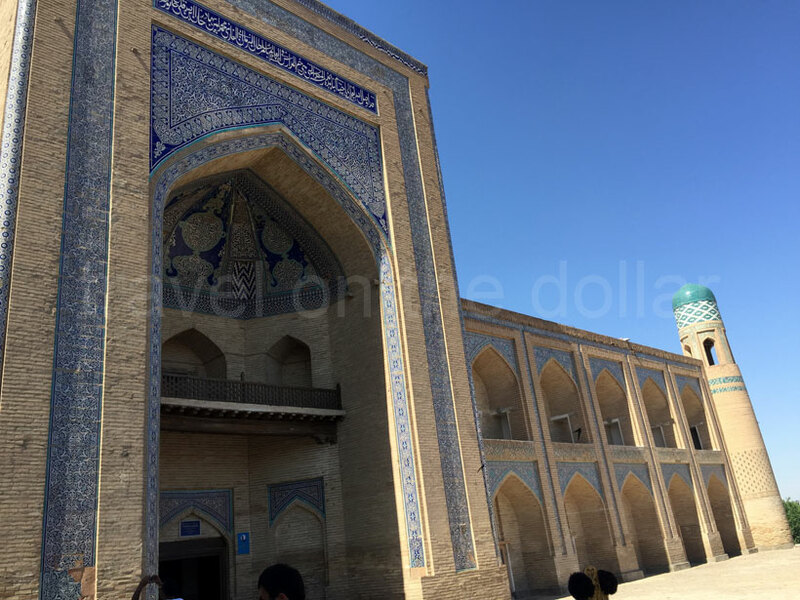 Just turn right from the entrance of Makhmud Pahlavan’s mausoleum, and you will see the towering Minaret of Islam Khoja complex. 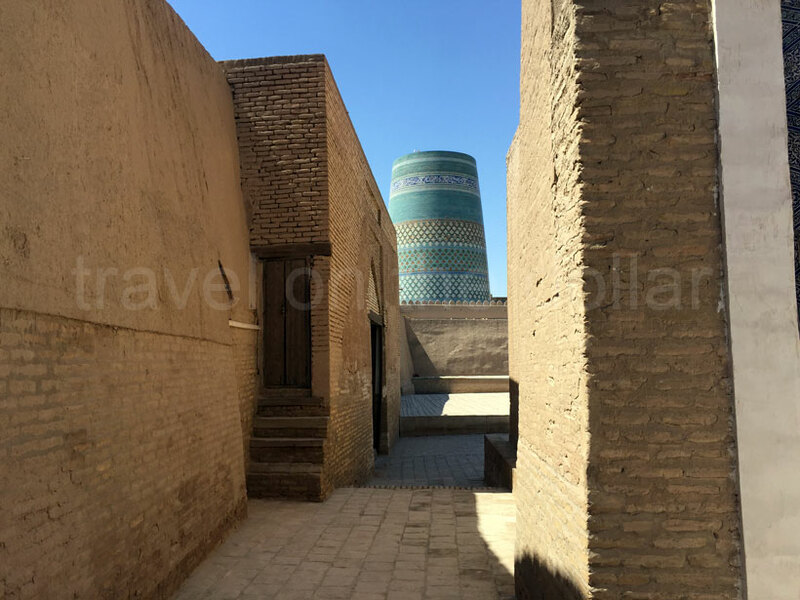 This “modern complex” dates back to the 1910 and has a minaret and a mosque. 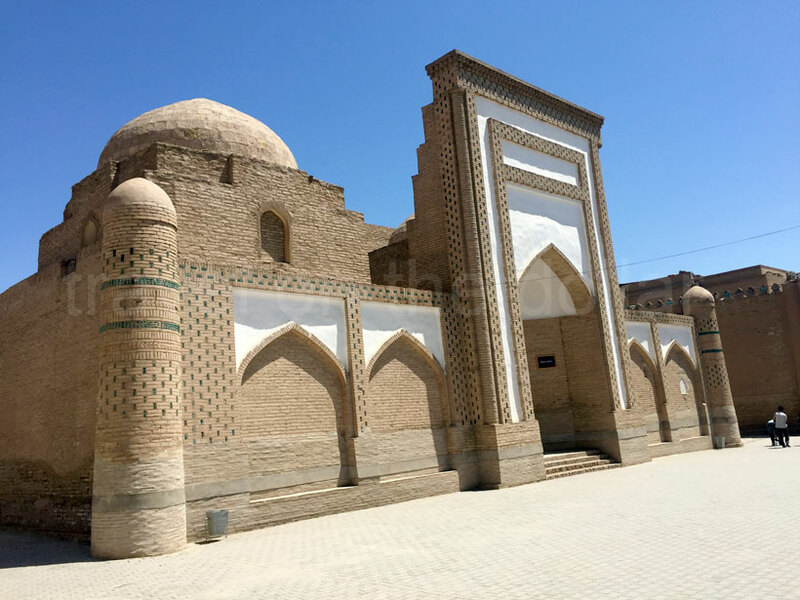 The complex is called in honor of Islam Khoja, Prime Minister of Isfandiar Khan. 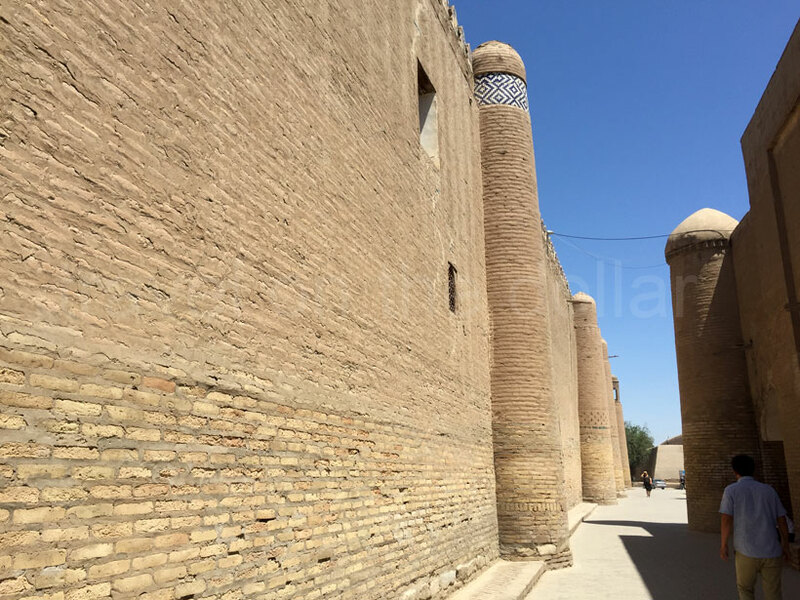 It is narrowed upwards, which dates back to the earliest examples of the architecture of the XIV century. 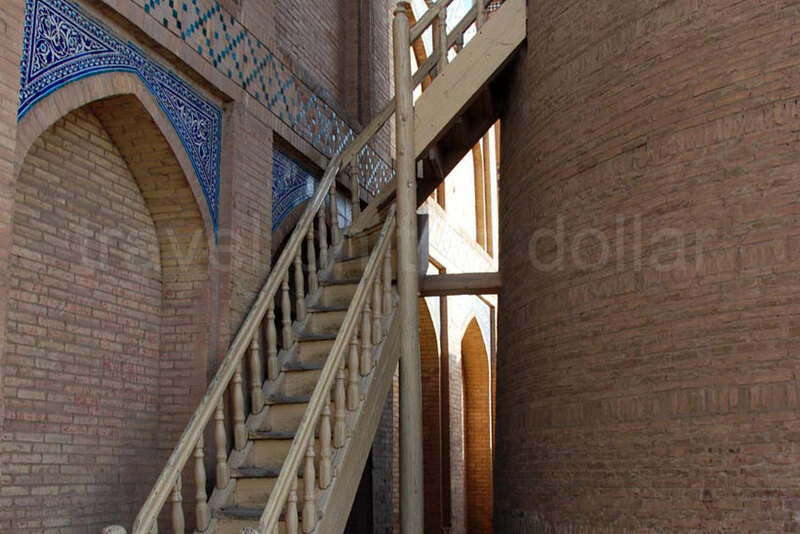 The brickwork alternates with bands of glazed patterns on the minaret. 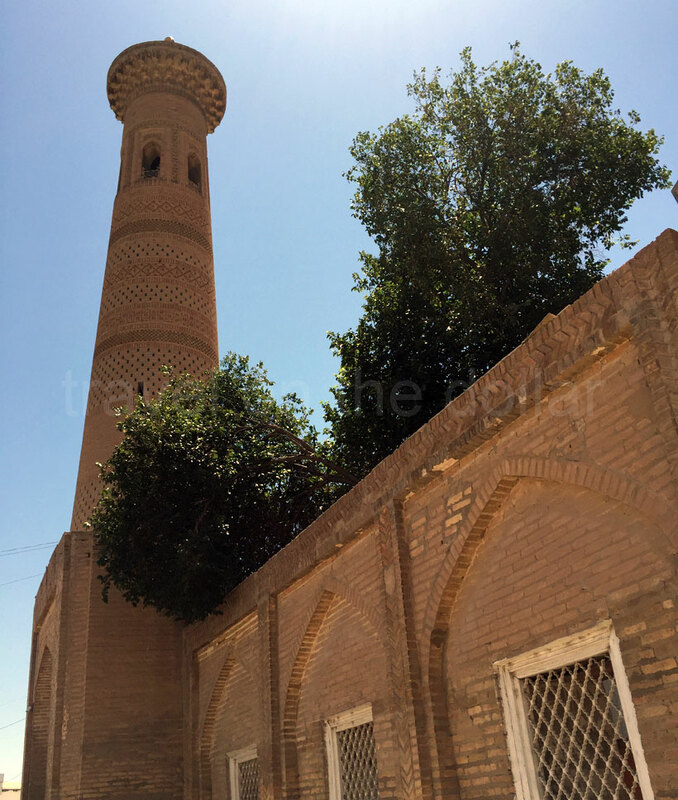 The height of the minaret 56.6 meters, diameter of the fundament is 9.5 meters at the base. 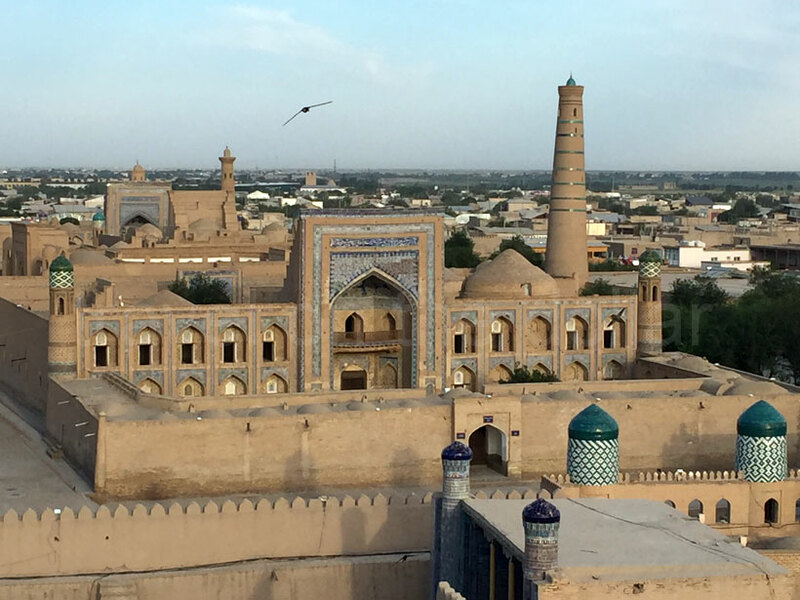 For UZS 5000, you can give your glutes a workout and climb up to the top for panoramic views of Khiva. 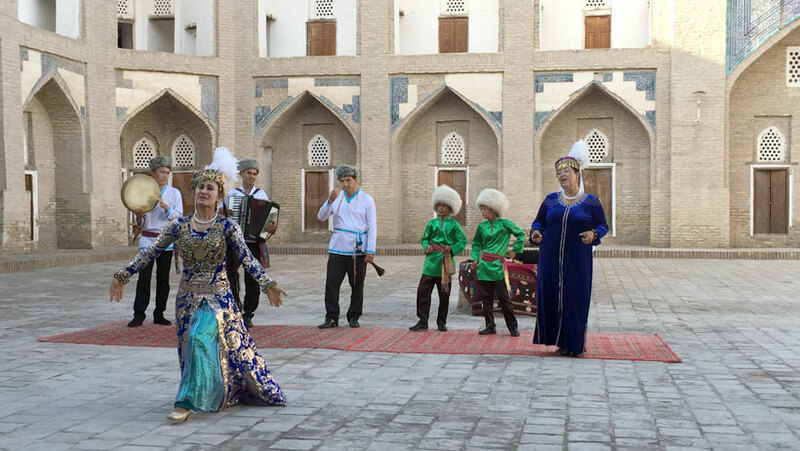 There is a cultural dance show every day near the souvenir shops at Allakuli Khan Madrasa which begins at 6:30pm, lasting for an hour. Tickets need not be booked in advance, but it’s recommended in high season. 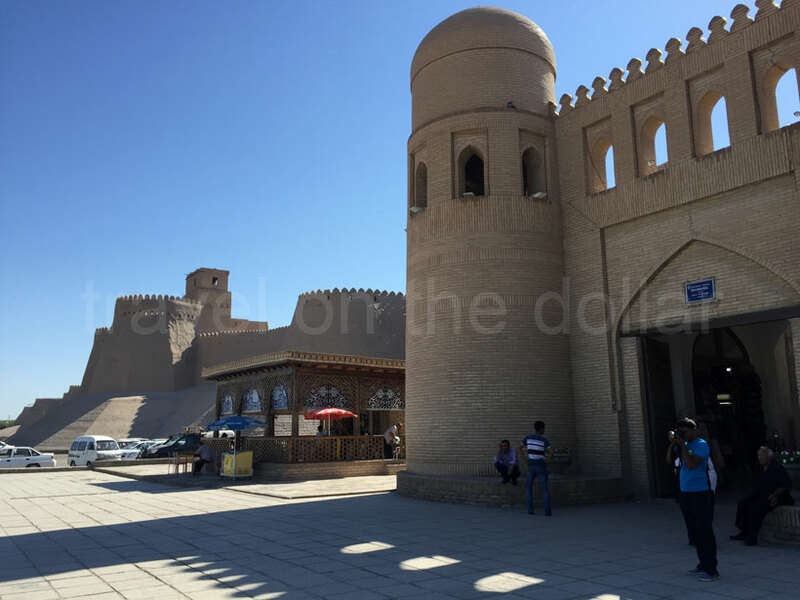 Right after the show, head out to the North Gate (Bachtscha Darwase), from where you can climb the walls of the fortress and walk to the viewing tower. It costs UZS 5,000 per person to access the rooftop from where you have some of the best views of this magnificent fortress city. Past sunset, stroll around and stop by one of the few restaurants for dinner.